They had seen a lot of Linda since the divorce. The first and the last times she and Sallee met happened within a space of eighteen months and a couple of hundred feet. Sallee would always remember that first time: Her dad picking Linda up outside of the hospital on a cold blowy Friday afternoon in early March, Linda running down the wide cement steps waving and smiling, and her father saying, “We should get some kites. March is the best time for flying kites. Gordy, get in the back so Linda can sit up front.” Gordy started to turn around to climb over the seat when Linda opened the back door and jumped in with Helen and Sallee. “It’s fine, Joe,” Linda said with a sunny smile that instantly melted Sallee’s heart. It didn’t hurt that she was wearing the coolest nurse’s outfit Sallee had ever seen. The cap, what a cap — starched with peaks and valleys like a mountain range and her nurse’s pin! “I’d like to sit back here with the girls, if that’s all right with you and Gordy?” Gordy looked dumbstruck while Joe’s beam of assent lit up the car. Linda turned to Helen and Sallee. “I had heard that you were both such beautiful little girls, but I didn’t realize that your Daddy wasn’t exaggerating.” She leaned in close in a conspiratorial way. “You know the way Daddies do when they talk about their girls,” she whispered and then winked. Linda – this remarkably exotic grownup sitting in the back seat next to Helen and Sallee – mesmerized them. She reached up and removed the bobby pins holding her nurse’s cap, and a wisp of dark hair fell around her face. Seeing Helen’s eager look, Linda placed it on the child’s head, taking care to pin it to her soft blonde curls. Helen, never one to miss an opportunity for affection, plopped herself in Linda’s lap and wrapped herself in Linda’s willing arms. The magic lasted longer than in a standard fairytale. They saw Linda every time they went to visit their father for months. Visiting Joe had always been an adventure, but with Linda everything was more–more zest, more laughs, more new things. The idea that a grownup would play dress-up was unheard of before Linda. And she had some of the most wonderful clothes for dress-up. Joe’s house began to fill up with all matter of material for the purpose: a uniform that she didn’t use anymore, complete with a hat, and all kinds of things she had left over from dance recitals. They learned songs and dance steps while dressed as princesses and queens, dripping with beads and glass jewels. Linda possessed a vast storehouse of girl novels too, to go along with her encyclopedic knowledge of Nancy Drew. Sallee couldn’t believe that she had read every single volume and could remember all of their plots as if she’d just read them. If Sallee happened to mention that she was reading a particular title, Linda was as conversant with the particulars as if it was lying open on her nightstand. To say she loved Linda would be an understatement. Adored would be closer to the mark. If it had been possible, Sallee would have absorbed her into her being the way you breathe in the essence of a spring day–the sunshine, the birdsong and the fragrance of lilacs scenting the magical air, as if you could capture it forever in your lungs. Her clean smell, like sheets drying in that perfect spring air, had just the tiniest hint of flowers with a dash of earth. When Linda turned her gaze on Sallee, her eyes filled with curiosity and delight, as if what the girl had to say was going to change the world forever. When absent, Linda consumed Sallee’s conversations. Unfortunately, she had few people with whom she could converse. Helen was such a baby. When they were at their mom’s house, talking about anything that went on at their father’s tended to make Helen so nervous that Sallee had stopped bothering. Gordy was less than worthless, you were lucky if he even looked up from whatever he was doing and gave you a dirty look. Was it since the divorce, or since their old bloodhound Lance was killed or when he’d turned fourteen? She wasn’t sure, but for sure he wasn’t an ally any more. 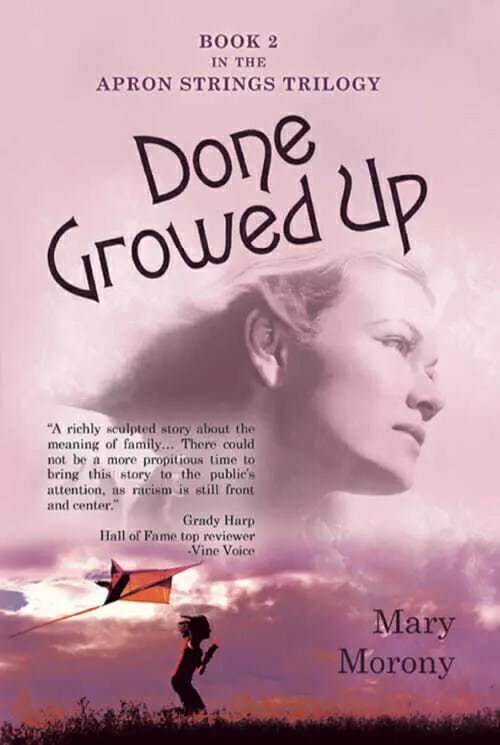 I will email you the first chapter of Done Growed Up ASAP! BUY DONE GROWED UP NOW!